Konica Minolta wanted to develop a customized internal sales tool that meets the needs of their sales team and distributors. They turned to us to develop an enterprise solution that streamlines the best resources to increase customer engagement, conversions, security, efficiency, and knowledge. myCME provides certified/accredited education from a variety of pre-eminent institutions and is designed to meet the needs of physicians, nurse practitioners, physician's assistants, pharmacists, nurses, and other healthcare professionals. Clinicians turn to us Continuing Medical Education they need, when they need it, all designed to be clinically relevant to their practice. 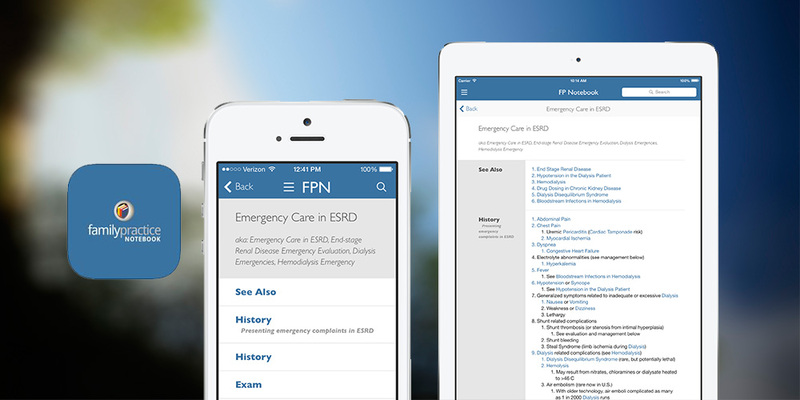 Family Practice Notebook is a rapid access, point-of-care medical reference for primary care and emergency clinicians. The Notebook's collection now contains over 6100 interlinked topic pages divided into a tree of 31 specialty books and over 700 chapters. Executives from all sectors of the healthcare industry turn to Modern Healthcare’s award-winning coverage of business and policy news, opinion and insight to inform their decisions and improve the performance of their organizations. The MPR App provides concise point-of-care prescribing information trusted by more than 800,000 healthcare professionals and features time-saving tools that allow users to quickly make better prescribing decisions. IDdx was built for medical queries. Users picking search criteria to find lists of matching infectious diseases. All the symptoms associated with a disease or all the diseases associated with a symptom can be listed. The SC Magazine app provides information security professionals with quick mobile access to up-to-date news, comprehensive analysis, cutting-edge feature pieces, and contributions from industry thought leaders. In addition to the written content, there are informational slideshows on the latest research and other happenings, as well as editorial videos featuring informative interviews with top security experts. The myGainesville app is your free mobile guide to all upcoming events, things to do, and cool places in the Greater Gainesville area. Never miss an important community event again! Featuring a live stream of local events customized for you based on your own interests. You can share, add to favorites, and import events to your calendar. See what's happening in Arts, Business, Community, Dining, Education, Family, Leisure, Music, Shopping, and Sports in the Greater Gainesville Area.